Kronborg is a world famous castle located in the Danish city of Elsinore (Danish: Helsingør). 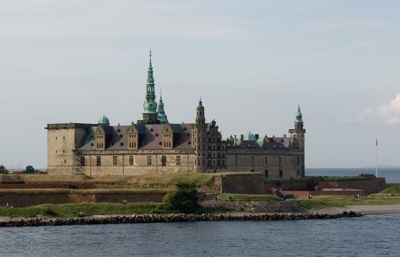 The reason that Kronborg is world famous, is its appearance (as Elsinore) in William Shakespeare's play, Hamlet, Prince of Denmark. The castle is actually located on the Northeastern tip of the island of Zealand, where the Øresund (the sound between Denmark and Sweden is at its narrowest - just 2.5 miles (4 kilometers). Obviously, in history, this was a strategically important point, as the castle had a commanding position on one of the few outlets of the Baltic Sea. The history of the castle dates back to the 1420s, when King Eric VII of the Kalmar Union (including Denmark, Sweden, and Norway) built a castle at the site, called Krogen. Later, from 1574 to 1585, King Frederick II of Denmark and Norway, tranformed the original Medieval stronghold into a Renaissance castle. During its long history, the castle did suffer damage through the ages - by fire in 1629, and when beseiged and captured by the Swedes in 1658 (who took many of the castle's art treasures as war booty). In 1785, Kronborg ceased being a royal residence and became an army barracks, a role which it in turn relinquished in 1923. Since then, it has been opened to the public. 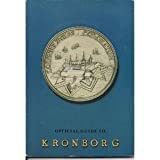 Additionally, since 2000, Kronborg has been designated as a UNESCO World Heritage Site. Nice used vintage paperback, clean, tight binding, nice inside and out. Many full page color photos on the Kronborg Castle in Denmark.